Post #188: Are We in a “Post-American Era”? Note: As Donald Trump makes his way to Beijing, the following article—just published in China-US Focus (https://www.chinausfocus.com/foreign-policy/2017/1101/15635.html) —may help put the trip in perspective. Trump will be dealing with a Chinese leadership that is much more self-assured about its international status than it was in Obama’s time. 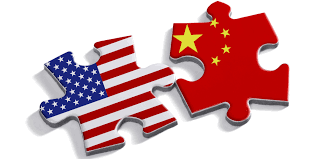 The theme of the September 2017 issue of China-US Focus Digest, a publication of the China-US Exchange Foundation based in Hong Kong and the Shanghai Institutes for International Studies, is “‘Post-American Era’ Arrives.” Various Chinese writers, all part of the foreign policy establishment, argue that although the US is and will remain for some time the world’s most powerful country, China’s time has come. “G-2” is a common shorthand for this new era: the US and China, whether collaborating or competing, are now co-movers of the world. Zbigniew Brzezinski, President Jimmy Carter’s national security adviser, may have been the first to use the phrase years ago, and now many Chinese seem to have bought into it. I’d say, however, that such an assessment is premature, and not necessarily welcome. Chinese analysts often prefer to categorize international events in terms of eras. The era just passed is one of American exceptionalism and the American Century, and in their view we are now in the post-American era characterized by Trump’s America First and China’s emergence as a great power. China, the analysts say, is a leader on behalf of sovereign equality, use of nonmilitary power, model of economic development, and promoter of international cooperation. They point to China’s advances in energy conservation technology and support of the Paris accord, economic achievements under globalization, and numerous strategic partnerships as evidence of its international coming of age at a time when the Trump administration has turned its back on global compacts and environmental protection. Clearly, a good part of the motivation behind these claims is Beijing’s upset over US trumpeting (you’ll excuse the expression) of America First and periodic talk of trying to leverage Chinese policy on North Korea using trade retaliation and arms sales to Taiwan. But surely another part, perfectly understandable, is a pervasive Chinese sense that the American experiment is failing while China’s is succeeding. While China’s leadership has kept social problems from exploding and avoided serious reforms of the one-party state, Trump’s America is deeply divided and becoming more so by the month. Legislative dysfunction, racial tensions, official corruption, assaults on media, violence, an opioid crisis, governing by tweets—you name it, we’ve got it. The Trump administration has in fact become a laughingstock of governments nearly everywhere. But the pervasiveness of America’s ills doesn’t necessarily translate into a world looking to China for new leadership. I and several other China watchers have written many times about its serious internal problems. Some authoritarian governments may overlook them as they eagerly accept Chinese aid and investments. But the breadth and depth of China’s economic, social, and political weaknesses cannot be masked by rhetoric—and in fact, the best Chinese analysts acknowledge them. It’s not enough to quote Xi Jinping’s latest homily on the Chinese dream or assert that China upholds democracy and the rule of law—not when Xi’s “thought” is being enshrined, like Mao’s and Deng’s, in China’s party constitution and lawyers, academicians, and human-rights advocates are under constant pressure to conform, or be jailed. On the international stage, moreover, claims of Chinese leadership are not convincing. Yes, Xi has embraced globalization, climate change, and all manner of regional trade arrangements while Trump has scoffed at the first, denied the second (a “Chinese hoax,” let’s recall), and withdrawn from the third (the Trans-Pacific Partnership). But on many other fronts, where is China’s leadership? Has China effectively come to grips with deforestation, desertification, water conservation, and air pollution? Does it set a positive example on internal migration, immigration, human rights (for women, ethnic minorities, religious freedom, and civil liberties), or respect for international law (in the South China Sea, for instance)? Will China’s much-touted “One Belt, One Road” Eurasia development project actually benefit people rather than economies? Has China contributed anything to the peaceful resolution of conflicts in the Middle East, from Yemen to Syria? Even on North Korea, Chinese criticisms of Kim Jong-un’s military buildup have not extended to a serious diplomatic campaign to reduce tensions between North Korea and the US even though China’s security is very much at risk. So call the current era G-2 if you wish. But an objective view would be that China’s rise does not yet put it aside the United States. (As Jia Qingguo, a well-known Chinese analyst, writes, “As China has two sets of national interests on many issues, it finds it impossible to pursue a coherent foreign policy.”) Perhaps more importantly, neither country deserves consideration as an international leader. China has all too infrequently avoided taking the lead on major international issues outside East Asia. Even there, China’s muscular behavior is regarded with fear as much as awe. In short, few governments around the world look to China to provide leadership. The US position is complicated by an administration that simply doesn’t seem to care what the world, including allies, thinks of its behavior. Europeans have apparently reached the conclusion that they are on their own when it comes to environmental, commercial, and political challenges. Canada and Mexico are likely to turn to Pacific trading partners should Trump pull the US out of NAFTA. South Koreans worry about an unpredictable US president whose “fire and fury” rhetoric might lead to war with Pyongyang, while Japanese worry about US reliability in a showdown with North Korea. In both those countries, talk of having their own nuclear weapons is heard more frequently. Other than in Tokyo and Tel Aviv, Washington’s preference for military over diplomatic approaches to problems (North Korea and Iran being the best examples) has few supporters. The US continues to be militarily overstretched, involved in numerous wars large and small at extraordinary cost to itself and to innocent civilians. America First is supposed to mean that the US will no longer play the role of maintaining world order, but in fact it continues to be global policeman—deploying “240,000 active-duty and reserve troops in at least 172 countries and territories,” as well as some 37,000 on secret missions, according to the New York Times (www.nytimes.com/2017/10/22/opinion/americas-forever-wars.html). Neither the United States nor China has shown interest in common security principles or practices, which would require consistent collaboration on the most urgent global problems: nuclear weapons, climate change, and poverty. Rather than focus on “the era,” these two great powers might better consider two fundamental issues: how to manage their differences so as to avoid confrontations, and how to cooperate in ways that truly benefit human security.